21 Sept 2015 – the members of the newly formed International Actors Ensemble met for the first time for the 2015 International Actors’ Fellowship stepping onto Shakespeare’s Globe stage in London. 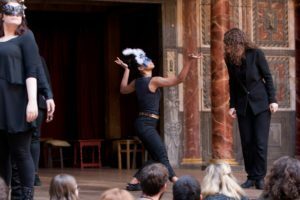 21 actors from 14 countries participated in a three week residency which culminated in a two-hour multi-lingual and multi-cultural exploration of Shakespeare in the world. To make this all happen, in different locations around the world we need help to raise money for materials for costumes, set pieces and lighting; to work with great stage and costume designers, musicians and choreographers, and to bring our unique workshops to students and actors. We look to the world’s Shakespeare and theatre lovers to assist our journey by supporting our Indiegogo crowdfunding campaigns, purchasing merchandise and help the International Actors Ensemble take their first steps around the world! For more information contact us or support us here.